Work with the equation to find the axis of symmetry, focal distance, and directrix. To find the axis of symmetry start with the vertex. The vertex of this parabola is (3, 1). The axis of symmetry is at y = v, so for this example, it is at y = 1. For the equation given, a = 1/8, and so the focal distance is 2. Add this value to h to find the focus: (3 + 2, 1) or (5, 1). To find the directrix, subtract the focal distance from Step 2 from h to find the equation of the directrix. Because this is a horizontal parabola and the axis of symmetry is horizontal, the directrix will be vertical. The equation of the directrix is x = 3 – 2 or x = 1. Graph the parabola and label its parts. The figure shows you the graph and has all of the parts plotted for you. The focus lies inside the parabola, and the directrix is a vertical line 2 units from the vertex. Square the variables in the equation. The squaring of the variables in the equation of the parabola determines where it opens: When y is squared and x is not, the axis of symmetry is horizontal and the parabola opens left or right. 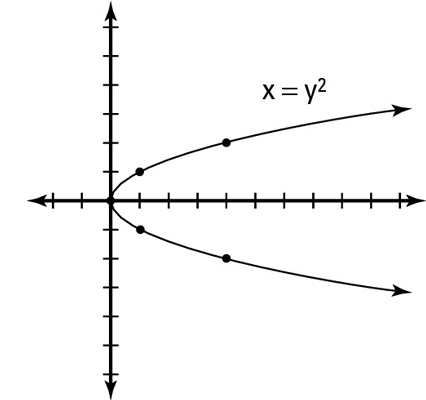 For example, x = y2 is a horizontal parabola; it’s shown in the figure. Be aware of negative coefficients in parabolas. 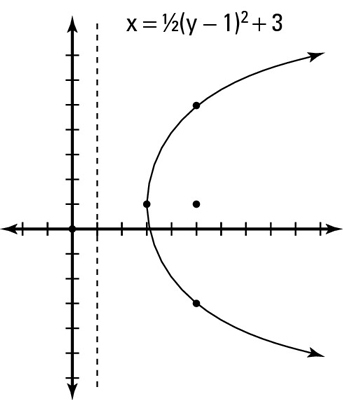 If the parabola is horizontal, a negative coefficient will make the parabola open to the left.